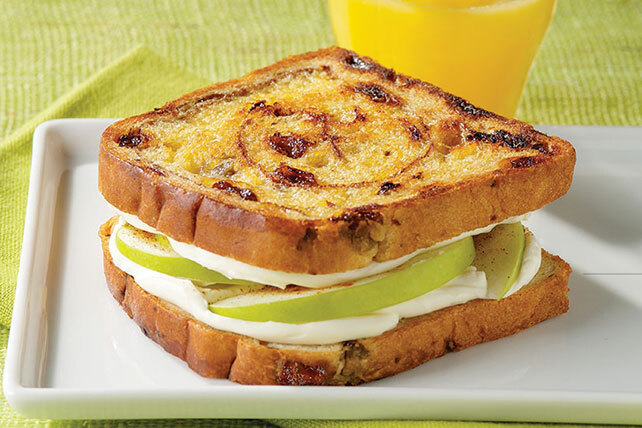 Savor the classic cinnamon-apple flavor in this creamy, crunchy sandwich. Its simplicity is part of its deliciousness. Our Cinnamon-Apple Morning Sandwich is perfect for any time of the day, really. Spread bread with cream cheese. Top 1 bread slice with apples; sprinkle with cinnamon. Cover with remaining bread slice, cream cheese-side down. Melt margarine in nonstick skillet on medium heat. Add sandwich; cook 3 min. on each side or until golden brown on both sides. For a quick-and-easy no-grill sandwich, prepare as directed omitting the margarine and using toasted bread slices.